Elizabeth “Betty” Mandell Heymans, 86, of Sleepy Eye, MN, passed away on December 1, 2018, in Albany, MN. Visitation will be on Thursday from 4 to 7 pm at the Divine Providence Community Chapel in Sleepy Eye. Funeral Mass will be held at the St. Mary’s Catholic Church, Sleepy Eye, on Friday, December 7, 2018 at 10:30 am. The clergy will be Msgr. John Richter. Interment will be at the St. Mary’s Catholic Cemetery in Sleepy Eye. A luncheon will follow the interment in the St. Mary’s Church Social Room. In lieu of flowers, please send memorials to St. Mary’s School, Divine Providence Home, or the Food Shelf, all in Sleepy Eye. Betty Mandell was born in Faribault, MN to Harry and Julia Mandell on April 8, 1932. She graduated from the College of Saint Benedict in St. Joseph, MN, in 1954, with a BA in Elementary Education. She married Philip Heymans on August 20, 1956. She worked as a Catholic grade school teacher and as development director for St. Mary’s, which included editing St. Mary’s Recall newsletter. She was a loving mother to eight children. 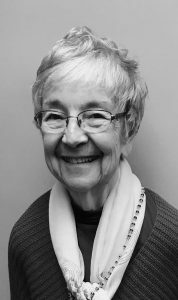 She was actively involved as a volunteer for St. Mary’s Church and School, Divine Providence Home, and the Sleepy Eye Food Shelf, and a strong supporter of Minnesota Citizens Concerned for Life. Betty was known for her joy, creativity, hospitality, and eagerness to serve the Church and community. She valued her Irish heritage, enjoyed feeding and watching the local birds, and had a great love of writing short stories in her youth. She lifted up those around her with her smile. Betty is preceded in death by her parents. Betty is survived by her husband of 62 years, Philip Heymans; children Steven (Susan Sink), Amy (Kevin) Kluesner, Ann (Larry) Rodich, Greg (Mary), Tim (Annie), Mark (Yoneko), Maria (Paul) Becker and Tina (Mark Herzog) Arneson; brother, Art (JoAnn) Mandell; 18 grandchildren and 3 great-grandchildren. The family wishes to extend our sincere thanks to the staff of Mother of Mercy Senior Living in Albany for their loving physical and spiritual care and special efforts at the end of Betty’s life.